It is seen through the eyes of a young woman named Raven Blackheart. It is a future where corporations rule the world and political parties have been dismissed. An Earth that is recovering from a global war that has divided two races: Humans and Dracins: quick, tough skinned creatures that are children of the side effects from 20th century pharmaceuticals. Raven awakens in this world as a product of both races and nurtured by the vice president of the main corporation in the world as a symbol of the union of races. With her help, Vice President Tyler Deamond’s corporation can take both beings off Earth--which is quickly becoming a waste planet--and to the new terraformed planet, Jupiter II. But, as Raven learns, nothing is as it seems, especially concerning humans. 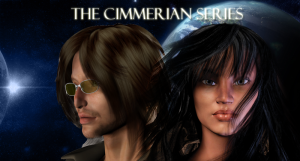 The Cimmerian duology centers around three central characters, including Raven herself. Raven's family ties also shape a big part of her present and future. With a mixture of Egyptian and Native American heritage, she is a woman who lived on a reservation after losing the only family she knew to a corrupt world who saw its inhabitants as commercial experiments. The mysterious Enos Relim, a strong willed, whip smart man from the Blackfoot tribe, eventually trains and mentors Raven. He also helps her find out the truth about what happened to her father who disappeared mysteriously years ago. The brilliant Russell Li, a young handsome Chinese American man, works as an engineer at a prestigious corporation. Soon he is invited to move up in his career...but at a price that ultimately ends in costing a part of his soul. In the beginning, all three lose someone close to them, an experience which binds them for the rest of their lives. 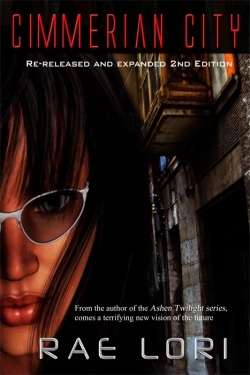 Cimmerian City, the re-released second edition, is now available in online bookstores and is also coming soon to second edition print. The sequel entitled A Feast of Shadows, which explores upon the developing romance and the corporation's intentions, will be released shortly.